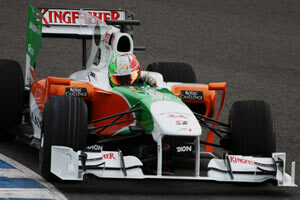 The Force India F1 VJM03 was launched on the team's website on 9 February, one day before its first test at Jerez. The team continues their technical partnership with McLaren for the supply of a complete drivetrain and technical support. The team retains its two drivers that finished the 2009 season and hope to continue their form improvement with steady and reasonable design evolution. The team's design director Mark Smith explained, "The VJM03 is definitely an evolution of the VJM02 in terms of the design philosophies we have developed at Force India over the last year. We are very happy with the direction, therefore we have opted to evolve the car rather than significantly revise." "Obviously one of the major aspects we have had to contend with are regulation changes which have had a considerable impact on some aspects of the design of the car. The removal of refuelling from races increases the amount of fuel needed to be stored in the cars - almost twice the amount we ran in 2009. There is a compromise now: either make the car much longer or wider, or, as we have done, a combination of both. This of course has influenced the mechanical design solutions and also the aerodynamics, specifically with respects to the diffuser and bodywork." Despite its evolutionary concept, the VJM03 is a rather interesting car given its special diffuser and some smaller bits and pieces. The front wing is similar to the 2009 specification, but the nose has been widened and now features a bulge underneath, in between the front wing supports. This can help generate some downforce at the front while also creating space to fit ballast. The Force India does not feature the Red Bull V-nose concept but instead has two small bulges to hide the push row suspension elements from open air. With the increased fuel tank behind the driver's seat, the sidepods have been slightly increased in size, reducing the undercut but still clearly alike the VJM02's sidepods. The air inlets are rather low as well, with blades just ahead of the entry to induce vortices and help cooling efficiency. The airbox on the other hand is a combination of air inlets. In addition to the traditional large entry above the driver's head to provide the engine with oxygen, one additional opening is under this air catcher, in between the two roll hoop supports. One further opening is added on each side of the airbox to provide cooling for components that sit behind and above the engine. Most interesting however is the rear diffuser. The team have taken the double deck diffuser far enough to justify not having a full width beam wing (lower element of the rear wing). Instead, the centre is left open to make sure the upward airflow from the diffuser is not hampered. Rear suspension: Aluminium uprights with carbon fibre composite wishbones, trackrod and pushrod. Inboard gearbox mounted torsion springs, dampers and anti-roll bar assembly.